To translate that word into something more easily digestible, this looks like a very pale pink. On the other hand, its power button is definitely a richer shade of pink. The same source (which is claimed to be reliable) has also shared a family portrait featuring three hues for Google's next-gen smartphones - black and white make an appearance alongside the Sand. It's unclear whether these are all the colors we should expect, or if the previously rumored (and sort of teased) Mint colorway will be announced on October 9 as well. Anyway, the Pixel 3 XL's unsightly notch is still there, in case you were wondering. And so is its not at all small chin. 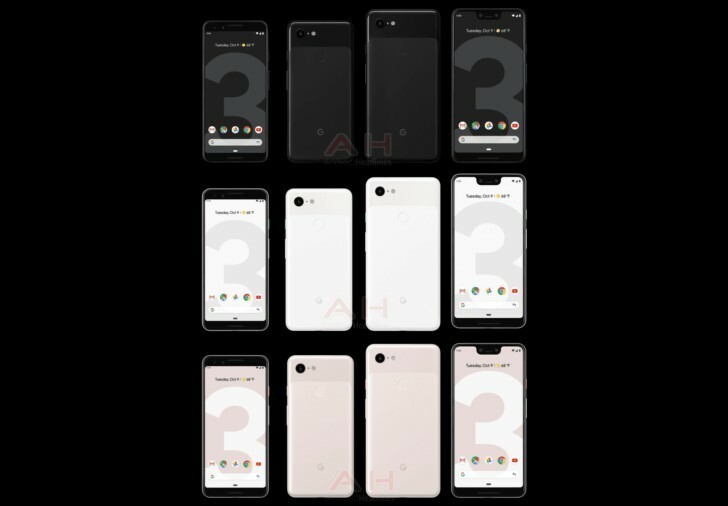 According to the source of these renders, there will only be two handsets coming out - these two. No Pixel Ultra conspiracy, sorry. Spec-wise both models should sport the Snapdragon 845 chipset, along with at least 4GB of RAM and 64GB of storage, Active Edge functionality for invoking the Google Assistant, a USB-C port, and Android 9 Pie on board. The Pixel 3's screen resolution is said to be 1080x2160, while the XL will have 1440x2960. The battery in the smaller phone is allegedly a 3,000 mAh unit, whereas the bigger one gets a 3,430 mAh cell.